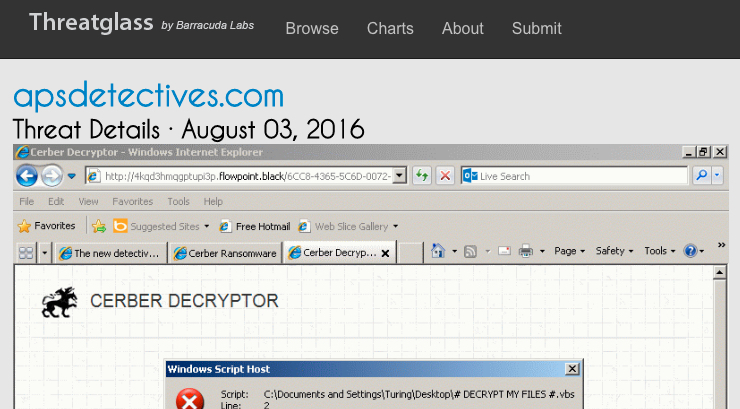 Noticed Magnitude EK sending Cerber ransomware on a Threatglass post from Wednesday 2016-08-03. I filtered and sanitized that traffic, and I've included a pcap of it with this blog. Shown above: Threatglass post with the pcap containing Magnitude EK traffic. Shown above: Infection traffic from the Threatglass pcap on 2016-08-03 filtered in Wireshark. Shown above: Infection traffic from my pcap on 2016-08-05 filtered in Wireshark.